Affordable Accoutrements: "Day into Evening" Table, with April Cornell Giveaway! "Day into Evening" Table, with April Cornell Giveaway! At the end of last week's tablescape post, I mentioned that I'd be back with something vintage, borrowed, and possibly blue. That's evolved into something old, something new, something borrowed, and (naturally) something blue. No, it's not a wedding, but it's almost time for the 73rd Annual West Tennessee Strawberry Festival! Visit the Festival's official site, HERE for further information. The berries below weren't grown in Tennessee. We'll have to wait a few more weeks for those. The "something new" is a beautiful tablecloth that just arrived from April Cornell online, home of beautiful clothes, linens & home decor. 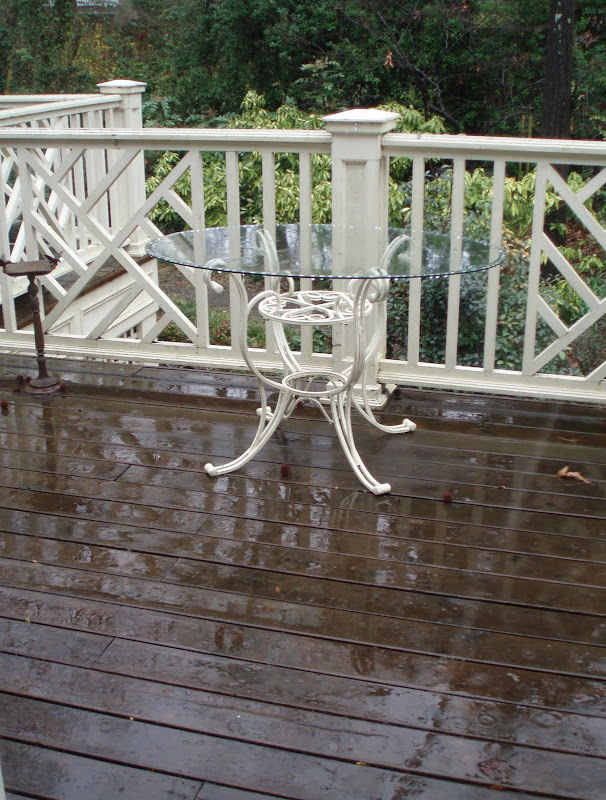 I'd planned to set a table for you on the deck ... but the weather didn't cooperate. Instead, I dried off a glass-topped square table (with rounded corners) from the lower deck and brought it into the solarium. I've set tables for you in this room before, but on the table for 8 at the other end of the long, narrow space. This end is normally a seating/reading area, but it was easily converted for a cozy brunch. 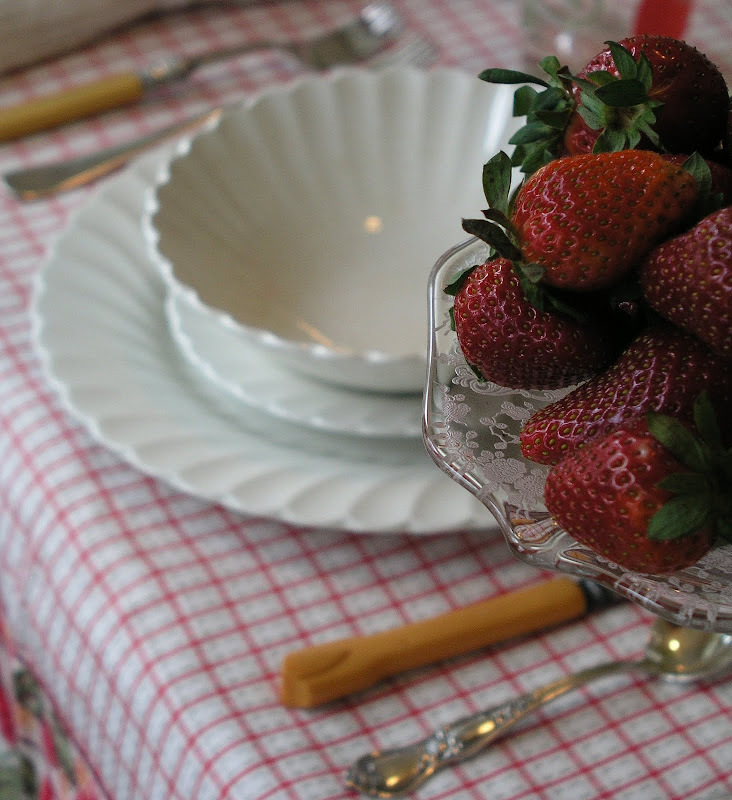 April Cornell's strawberry theme is my favorite of her current tabletop collections. I love the vintage look and the softness of the colors. The edges have a weighted feel, and the cloth drapes beautifully. I thought the space called for a tall, airy centerpiece. What could be more perfect that forsythia? Yes, I went out in the rain to cut it for you! Dedication to duty, or poor judgement? A little of both perhaps. It seemed to have started blooming overnight. Now it seems certain that spring has arrived! The "borrowed" items include the strawberry glasses and napkin rings. They belong to a lady I know whose kitchen and breakfast room are decorated entirely in strawberry-themed items. Her home has been featured on both American and Japanese television. There had to be fresh berries of course! They're being served on "something old," a vintage etched glass compote. It's a recent estate sale purchase. It was marked "Rose Point." 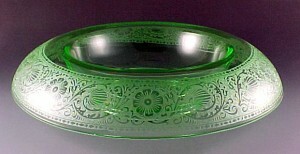 Rose Point was a popular etched design produced by the Cambridge glass company, beginning in 1935. I need to do further research, because I don't recognize the shape of stem (do you know Kat?). I suppose what matters is that I find it beautiful and couldn't resist going ahead and using it on today's table. The dishes are a mixture of similar vintage patterns by Johnson Brothers and Meakin (from Goodwill). 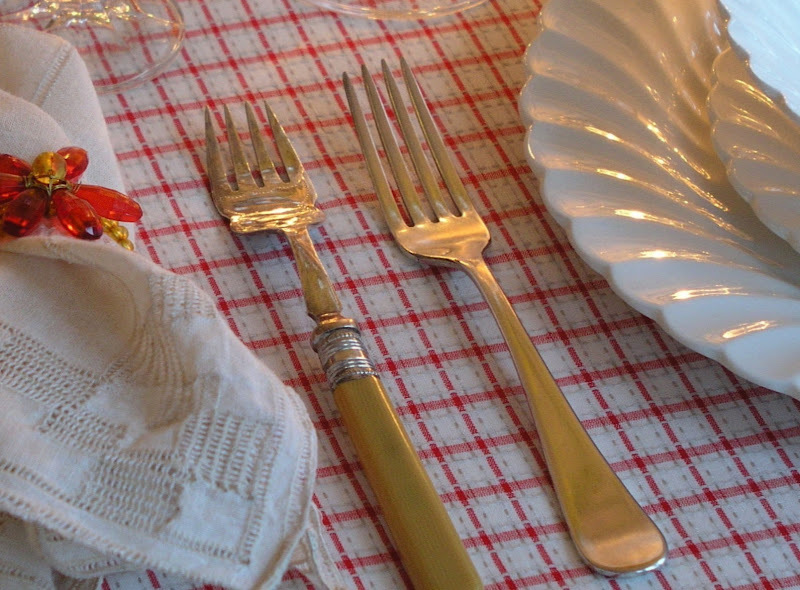 I set the table with vintage mis-matched silverplated flatware. Some have bakelite handles that echo colors in the strawberry fabric. A closer view of the glasses. The ones with diamond ball stems are "Claudia" by Bohemia Crystal. The charming small liqueur glasses were a gift from my Canadian friend, Lori of Family Trees May Contain Nuts. If you haven't met Lori, you should. She's possibly the funniest person on the planet, and definitely one of the very nicest! It's such a gloomy day that I had to light the candles early ... just to add a feeling of warmth to the table. 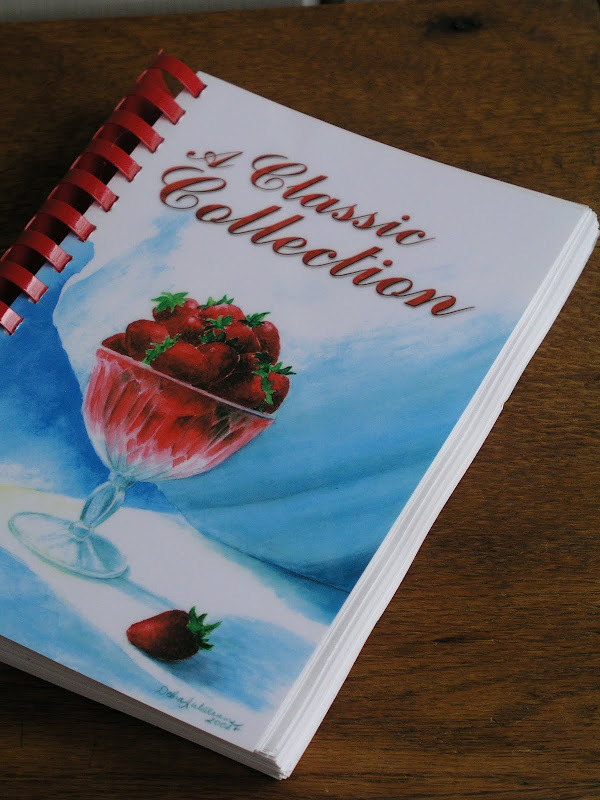 In trying to decide what to serve, I consulted an official Strawberry Festival cookbook (all strawberry recipes, of course!). Below is a vintage strawberry cookbook (illustrated by the author) ... from several decades ago. It's sitting atop one of my favorite home decor magazines. 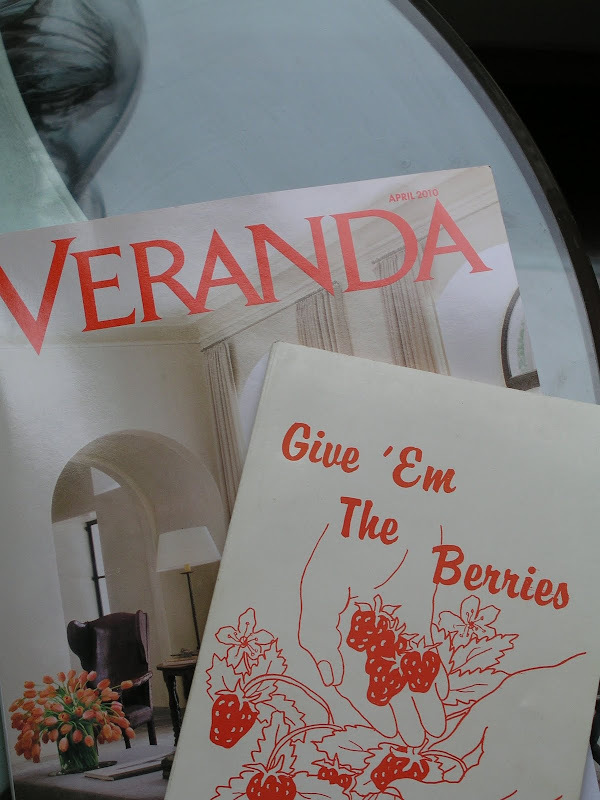 If you don't read/subscribe to Veranda ... well, I think you should! Now for the "day into evening" transformation. The tablecloth is reversible! How affordable is that? Two looks for the price of one! 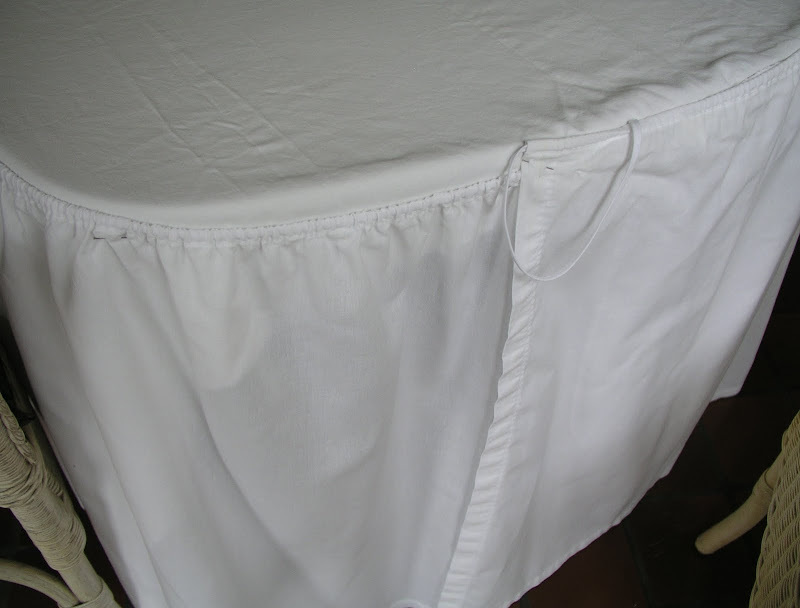 While I'm reversing the tablecloth, I thought I might as well show you the table's "undergarments!" I covered it with an old sheet and pinned on a skirt made from a new white sheet. It works for round, square, oval, rectangular, octagonal ... well ... any shaped table. 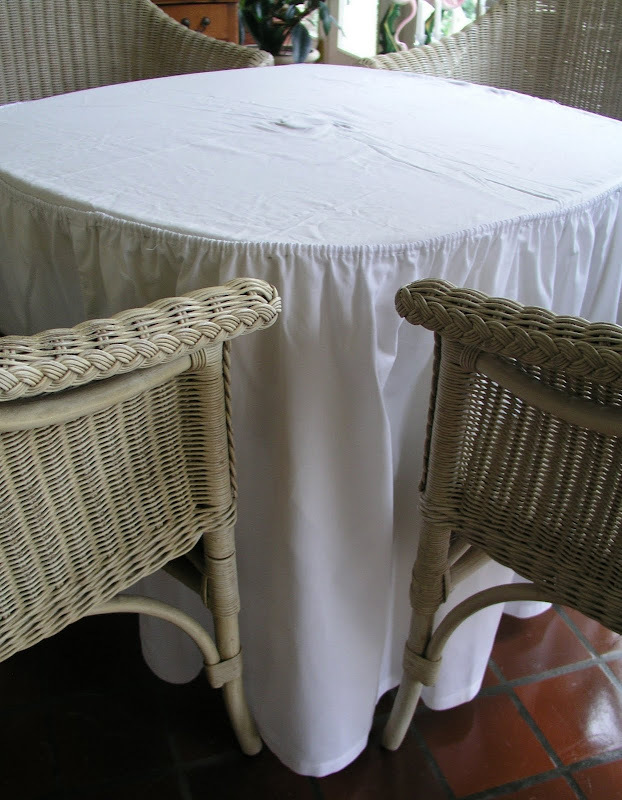 If it's a taller table, the skirt can be pinned to the sheet a few inches below the edge of the table. The drawstring's the secret that allows the fullness to be adjusted and evenly distributed. For larger tables, two or more can be used (overlapping slightly where they meet). 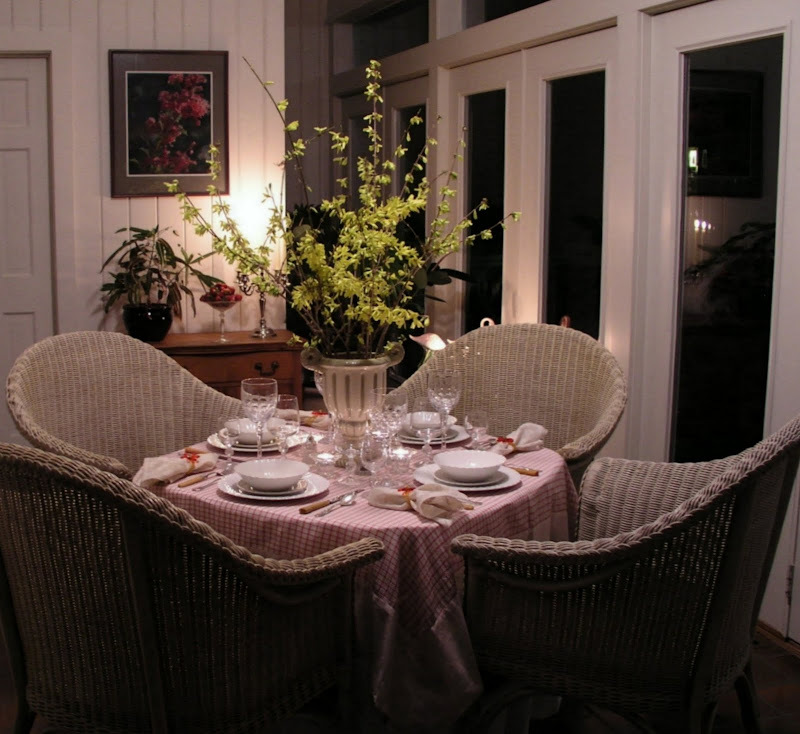 The table below would be suitable for an intimate, informal dinner for four. The strawberry patterned fabric reverses to a natural linen look. I've used the same plates, flatware, napkins, and Claudia stemware. These delightful beaded daisy napkin rings are by April Cornell. The coral color adds a bright accent to the "evening" version of this table. 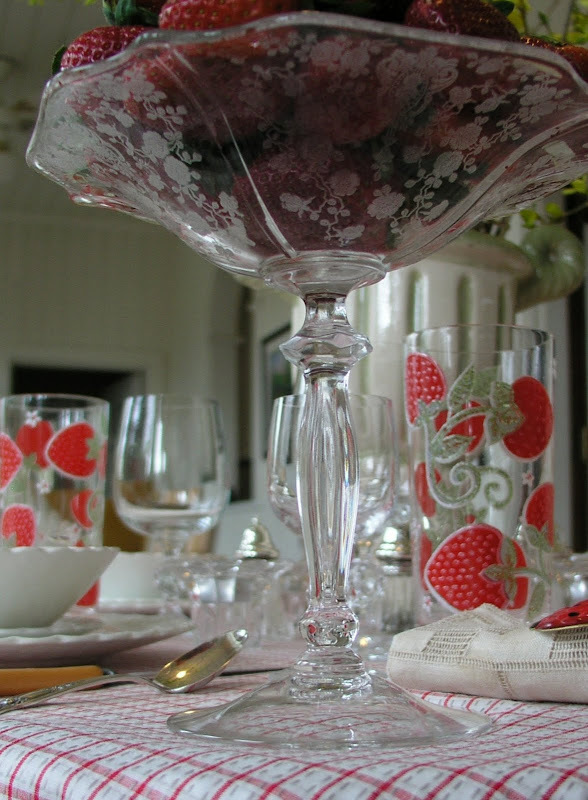 The strawberry iced tea glasses have been replaced with oversized wine glasses in the Marquis pattern by Towle. 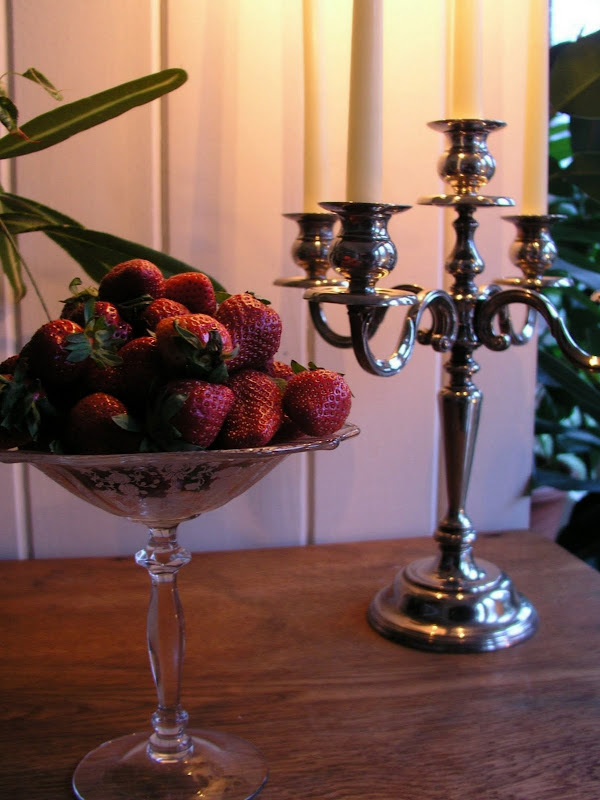 I couldn't resist having a silverplated candleabra nearby to add a touch of glamour. With the additional table, the room can comfortably seat 12 for dinner. The candleholder was an estate sale find. 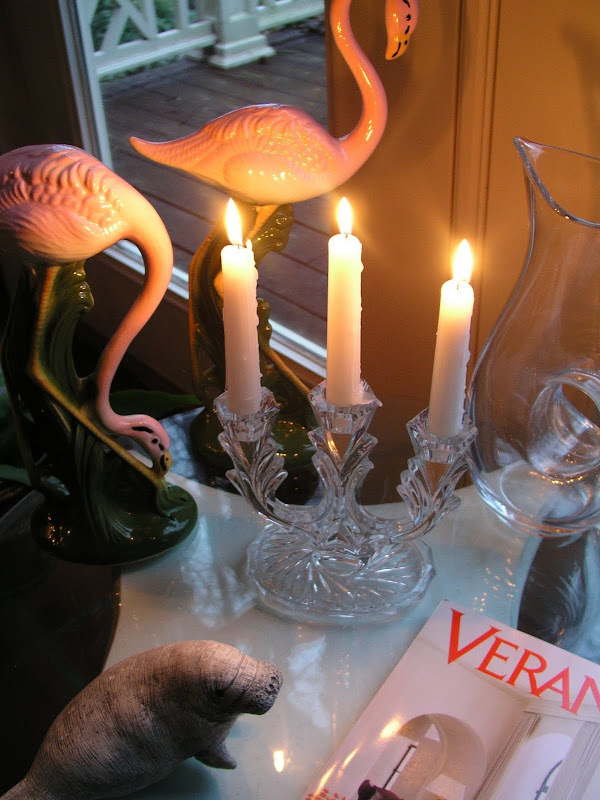 A three-light glass candleholder sits between the vintage pink flamingos and a modern glass pitcher. I enjoy mixing old and new, casual and elegant, thrifted treasures with family heirlooms. I think it adds interest, personalizes a space, and helps avoid the boredom that can occur when everything in a room matches too perfectly. The forsythia has opened further in the hours since it was "harvested." The set of four Godinger silverplated/glass salt & pepper shakers was only $1.49 at Goodwill. You probably know this, but salt should never be stored in sterling or silverplated shakers. They should be emptied and washed after every use to prevent oxidation. Now it's what Michael Lee West of Designs by Gollum calls "the blue time, those precious, fleeting moments before dusk takes hold." Can you tell from that evocative description that our Michael Lee's an accomplished novelist? I usually end with candles, but this evening I wanted to see the table with lights on ... until it's time for guests to arrive. 1. Visit the April Cornell website. Click HERE to view the Spring 2010 Linens Collections page. My favorite collection is (obviously) Strawberries. Take a look and decide which collection you like best. 2. Leave a comment on this post. Please include a mention of your favorite April Cornell collection. 3. Let me know if you're a Follower of Affordable Accoutrements. If you are, your name goes in the drawing twice. 4. If you subscribe via e-mail, mention that and you'll be entered three times. That's it! The drawing will take place on April 15. I hope you enjoyed this "day into evening" table as much as I enjoyed creating it for you. As always, thank you to our gracious hostess of Tablescape Thursdays, the very talented Susan of Between Naps on the Porch. 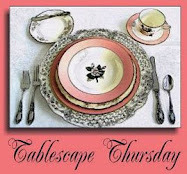 Please visit her HERE to view her beautiful tables and those of her tablescaping participants in this always-fun and inspiring weekly event. Hi Bill. What a beautiful table! The strawberries and forsythia are so...enticing is the word, I guess. I just realized, too, what it is I love about your photos. First, the close-ups make me feel as if I'm sitting right there, AND I love the way you take the viewer right into the evening. The candle light is beautiful. Okay...for your wonderful contest: I think Meadow Embroidery is really pretty. And yes, I'm a follower! Thanks, Bill! Bill this is such a pretty table. The strawberry collection is wonderful. I love her linens. I also love the Eden Yellow collection. Beautiful! I am a follower! Thanks!!! I love your beautiful tablescape Bill and thanks so much for introducing me to April Cornell's gorgeous products. I loved so many of the designs but I thought that Eden White was very pretty. I am a follower and would love it if I could enter your giveaway. Morning Bill, lovely table, makes me wish for Summer in the garden, tennis from Wimbledon on the television and a lovely bowl of Kent (the best)strawberries!! 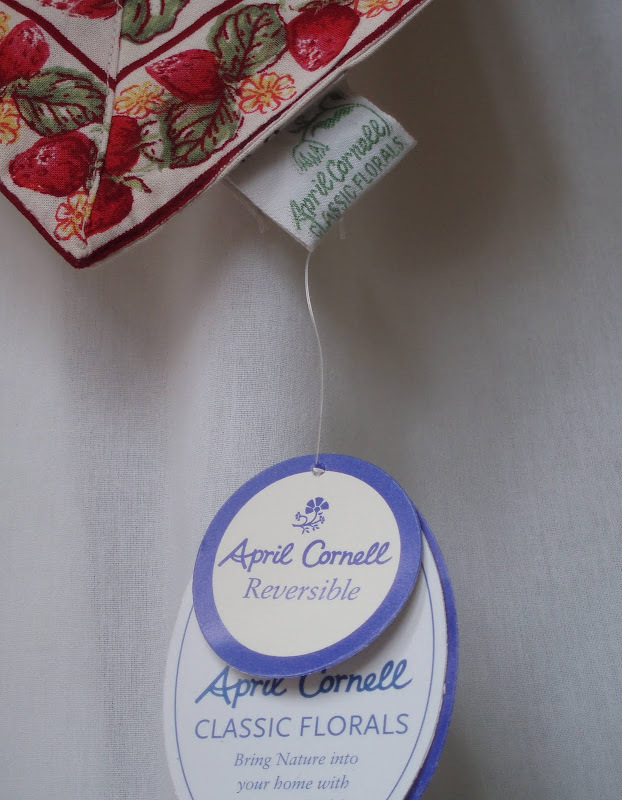 Haven't heard of April Cornell, but she is an American I believe.Love the reversible tablecloth. I would love to win the blueberry napkins so please will you enter me for the give away twice, as you know I am a follower too? Bill, Breath-taking, simple yet elegant. I am familiar with April Cornell, I have some nightware by her. My favorite is Primavera Peridot and Peony Jacquard. I am a follower. Love the forsythia -- or yellow bells as my grandmother called them. I love all her items! The clothing is great! I liked the Happy Fish Yellow linens though. Would be great for a childs party! 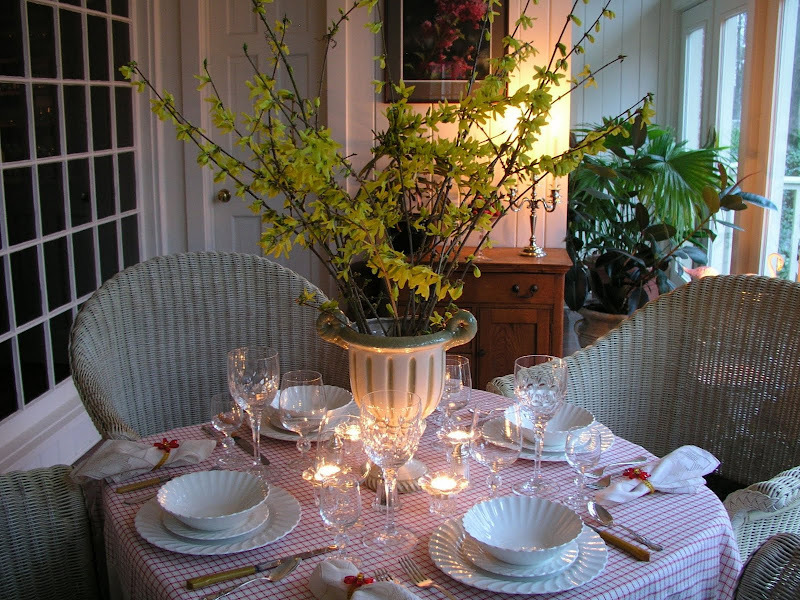 Your table is beautiful, and I love the forsythia. Chelsea Yellow is my favorite, it's so bright and cheery. My favourite is Papillon Jacquard - I'm a follower of your lovely and inspiring blog from which today I take away that utterly brilliant idea to make a draw string skirt capable of enveloping a range of table tops, the notion of "blue time" and a nudge to get out in the garden and clip some Forsythia branches so they're blooming in time for my Easter Table. I am just in awe over your fabulous tablesettings! The pairing and mixing of all your linens and china finds is so delightful! I actually prefer vintage to new, and have made many trips to our local Hyannis Goodwill, but the pickin's there are usually pretty slim. I love April Cornell's "Shannon Patchwork" because those blues are so very Cape-Coddish! ;) I've been a follower for several weeks now and just love your blog! Bill if I knew how nice those little glasses could look I would have kept them. They never looked like that at my house! Lol. I loved seeing the etching on the compote. It is a really pretty piece and versatile too. I have used a white sheet as an "undergarment" as you say but I think your idea of the drawstring is brilliant. With the two sheets you have such a nice base to layer upon and one would never guess they were sheets. Everything looks so perfect and just loved the presentation. Hats off to u for clicking so many pics and sharing them with all!!! Hi Bill, I just loved this tablescape. Thanks for showing it from different angles. I love the way it shows from the other room. The evening pictures are beautiful and evoke such feelings like a beautiful poem. 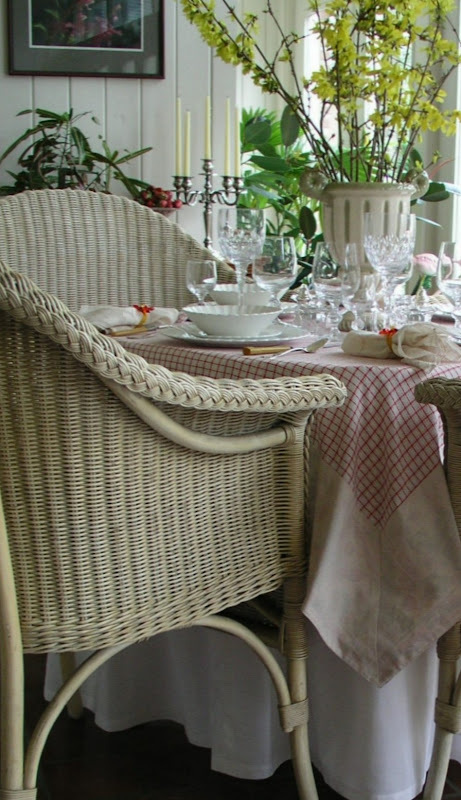 Thanks for posting about April Cornell, now I know where to go to find beautiful linens for my table. Eden yellow was my favorite. I'm a follower and I'm also an email subscriber. Hi Bill... You don't have to feed me... just let me sit at your elegant tables! Especially in the evening with the candles all a glow... 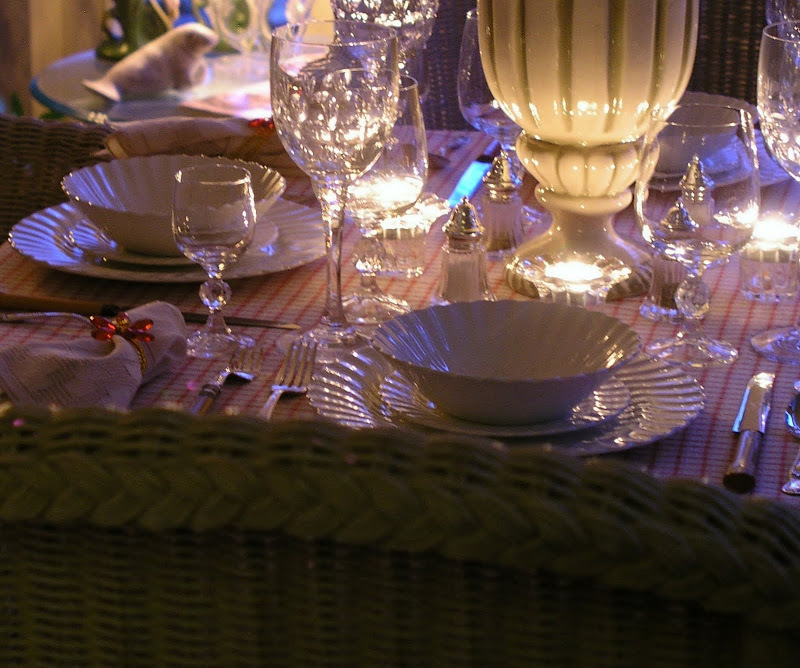 Absolutely beautiful tablescapes... Now did yo make that table skirt with the draw string? Bill, as always your table(s) are BEAUTIFUL! One thing I noticed right off is my beloved CLAUDIA!! I bought a huge amount of different sizes over 20 years ago from Gayfers (now Dillard's) for $4.50 a box/6 stems. I have treasured them and use them often. I have never seen anyone else with these until now! that just made my day. But, I digress, your use of light and color is always so beautiful and I love to see what pretty tables you have in store for us each week. I visited the April Cornell site and my favorite is "Chelsea" Light Yellow. I am also a follower and on your e-mail. Thank you for always setting such lovely tables and I will look for Claudia again! I think I like the primavera Peridot the best. So colorful and would look well with either my china or everyday dishes. I am a follower and I also get email updates! I like the way you show both a casual dinner table and a more formal look. It's nice to see you using basic glasses ( the strawberry ones). Love to see what you are up to. Hi Bill - I'm a follower and love the Primavera Peridot. Thanks for sharing the April Cornell website. Another "stunning setting" "by Bill!" My favorite April Collection is the Blueberry; yes, I am a Follower; yes, I subscribe via e-mail. Hi Bill! I'm a follower. I like the Eden Yellow Collection from April's website, so pretty. The Blueberry would match my current color scheme better. My aunt, Shirey would LOVE this tablescape! She has been a fan of strawberries in her kitchen decor for as long as I can remember. I am totally in love with the vintage etched glass compote! 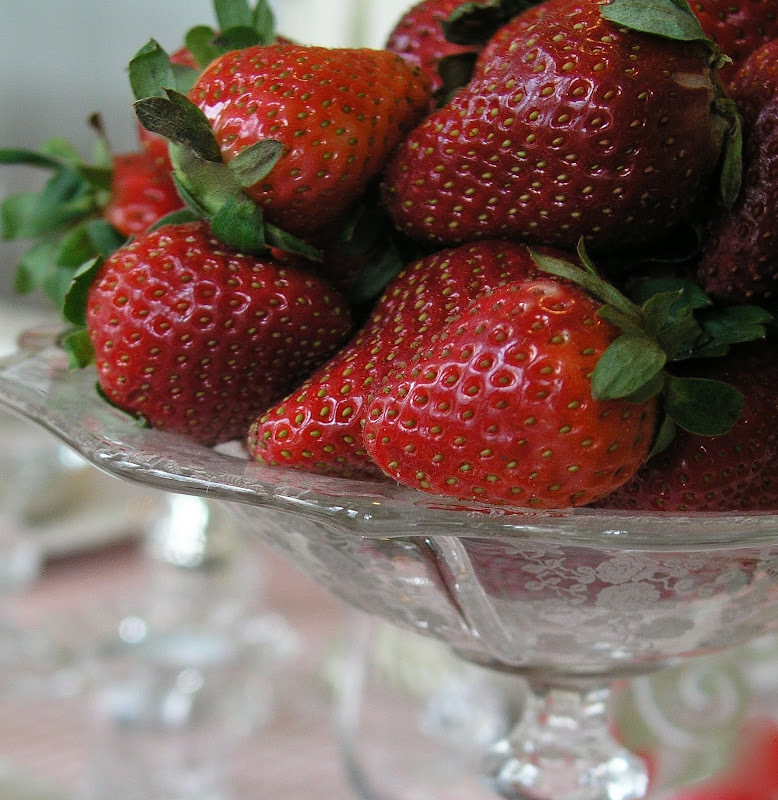 Exquisite & your photos are as delicious as those strawberries look. Of course, you know I'm a follower & I just signed up to receive the emails, too. I didn't know you had that option until just now. I checked out the April Cornell site & I'd have a tough time deciding between the Eden White or the Garden Plaid...or maybe even the Primavera Peridot! Love all those PINKS!! Beautiful table, as usual Bill. I can see I need to visit April Cornell! We're visiting TN, this Spring. Do you have any favorite antiques shops we might enjoy? We tend to meander with no set destination. So any location will be fine for us. HI Bill, another wonderful table AND a bonus: 2 tabl;es from one tablecloth!!!! I love them both! I am a follower, I susscribe by e-mail AND went to the April; Cornell sight and I THINK mu favorite is the California check. I love several of them but I think this is my favorite! whoops, sorry for several typos!!! Beautiful table, as always, I am never disappointed. The compote is just gorgeous...you find the best of the best at estate sales. 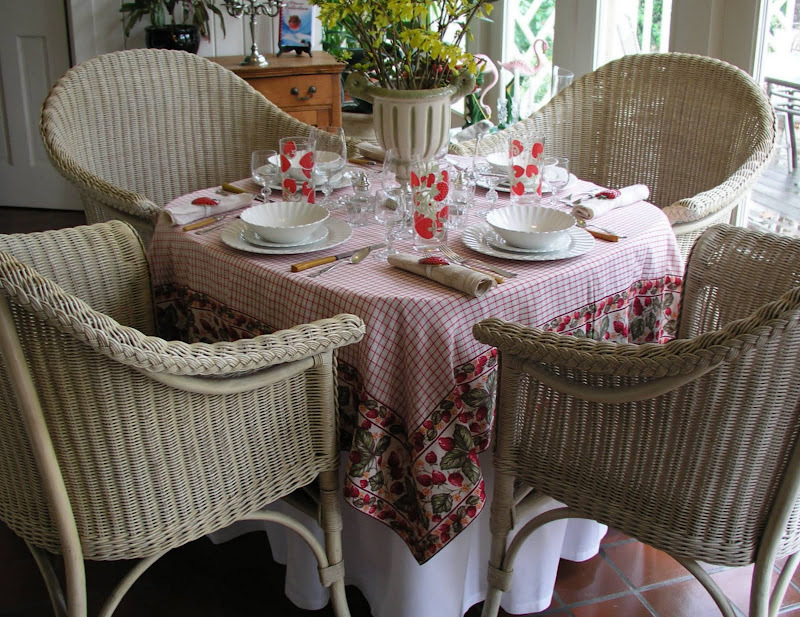 As a follower, I would love a chance to win that stunning Soleil Orange tablecloth. You have selected a perfect setting for the strawberry tablecloth. I love your wicker furniture; it pairs well with this scape. Forsythia is a favorite early spring flowering bush; mine is wanting to bud in the garden. I love glass, its transparency and the way it reflects everything around it. Your vintage strawberry stand is perfect for showcasing this attribute. Is cool the way you take the occasion into the evening with a change of details. 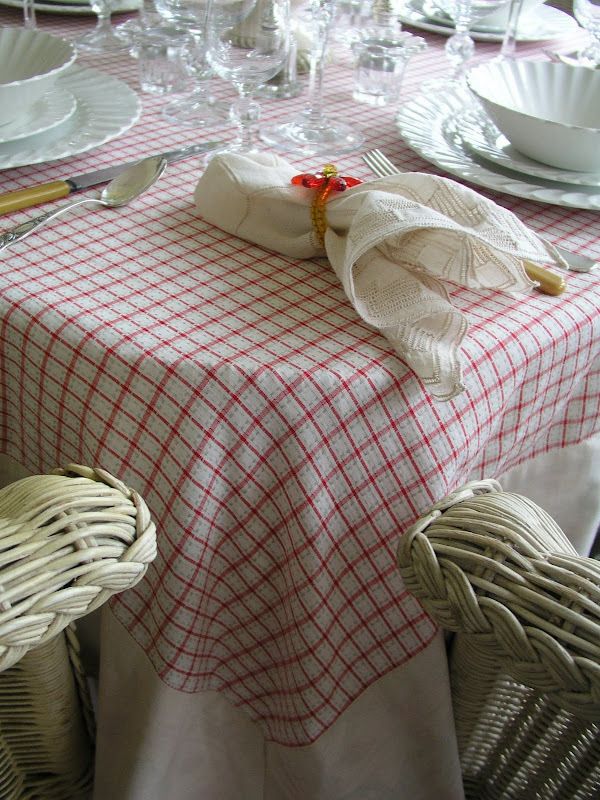 Oh I just love all of April Cornell's tablecloths and napkins. It's so hard to pick only one. I guess I would have to say Rose Garden. Though that blueberry one is to die for! I've never seen that one. I'm a big blueberry lover and would be sooooo excited if I won. I can't say enough about your beautiful tablescape. I love the different looks you got by only making a few minor changes. You always do a great job! Thanks for allowing me to join in on a chance of winning your giveaway. 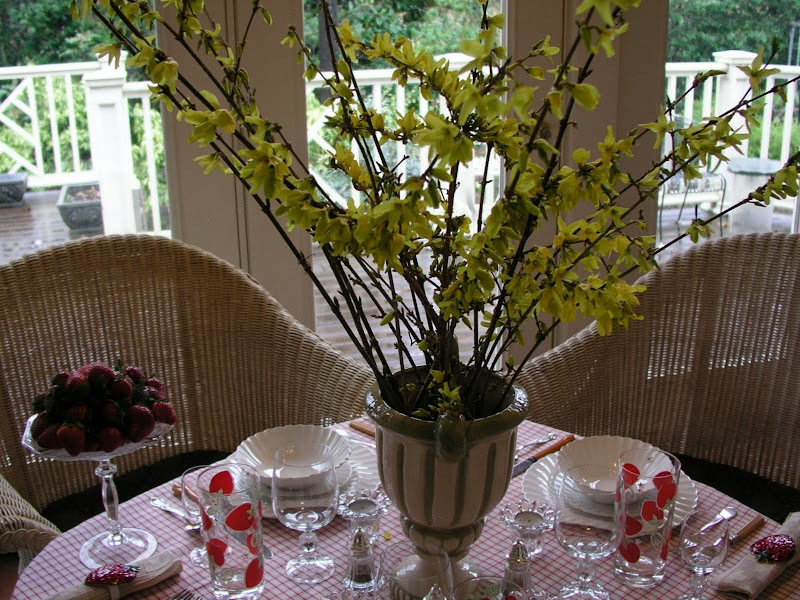 Love everything about your table, but the forsythia is the best! Thanks for braving the rain for us fans!!! Ooops I forgot to say, I'm a follower! I enjoyed your day into evening settings. The "Eden Yellow" collection would go well with several of my tableware sets. I am a follower of your delightful blog. As usual, everything is so lovely. You are so talented. 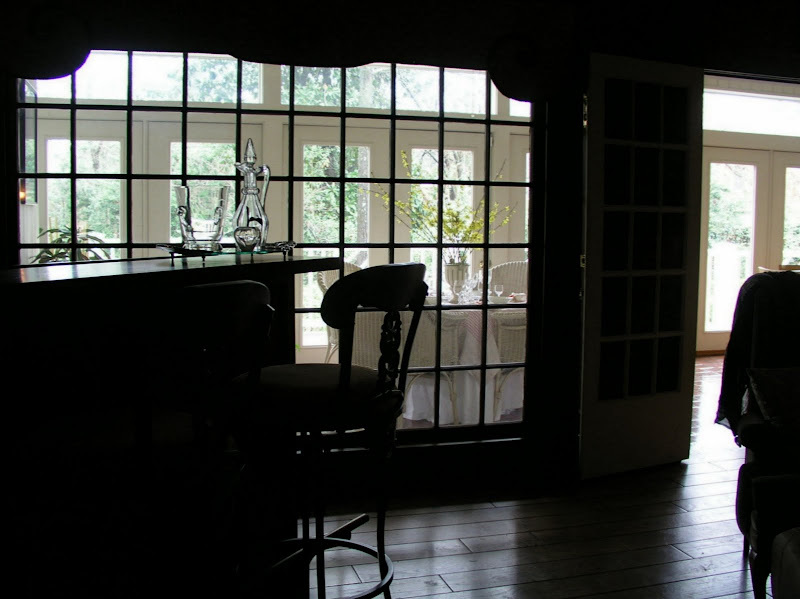 I adore all the different photos from other rooms, the way the light plays on everything, just fastinating. I think I need to plan some forsythia, this house doesn't seem to have any. I'm glad to be a follower and always look forward to everything you post. Thanks for all the beautiful things. Oh Bill, another beautiful table. You seem to do this each week without fail. I love all April Cornell's designs but I would have a hard time choosing between Rose Garden & Genevieve Yellow. Yes, I'm a follower and a e-mail subscriber and I'm thrilled each week seeing your gorgeous designs. I follow AND I just subscribed by email. I didn't know I could do that! Give the Girls my love...nice to see them out again. We have a little consignment shop near where I work called Flamingo Boutique...they won't sell ANY of their flamingos (pout!). And I have to choose? Rose Garden, Genevieve Yellow, and Garden Plaid pink! Just gorgeous! One of my favorite tables ever! I love the flowers, the tablecloth and your beautiful china! 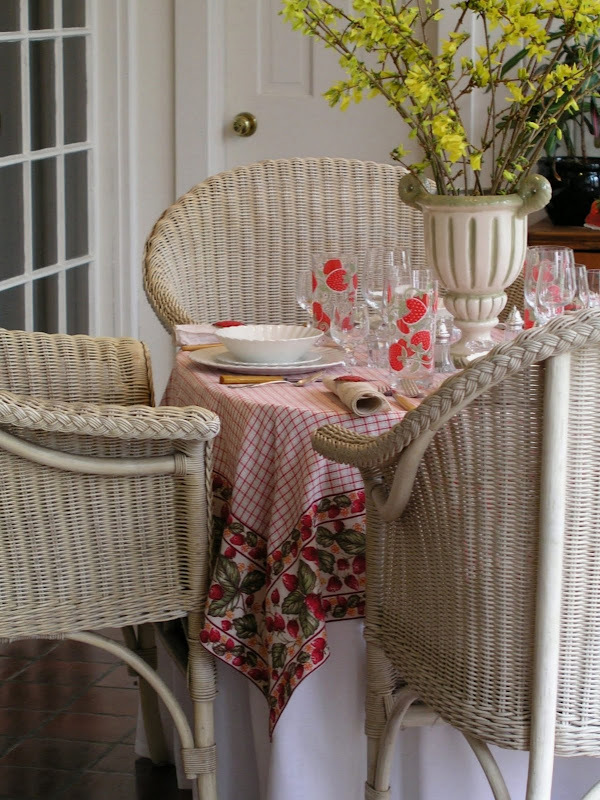 And your wicker chairs and table inside the solarium is just perfect! You sure know how to set a table my friend. Please enter me, I am a follower and I love the rose garden and blueberry one! Actually, I love them all! Great Job as usual, your tables rock! Thanks for going out in the rain for the forsythia! Where you are I'm sure the rain falls gently and warmly down from the sky. Out here, it's usually cold and windy and it bites! At least that's what it's like now! Hi Bill, This is another lovely table! 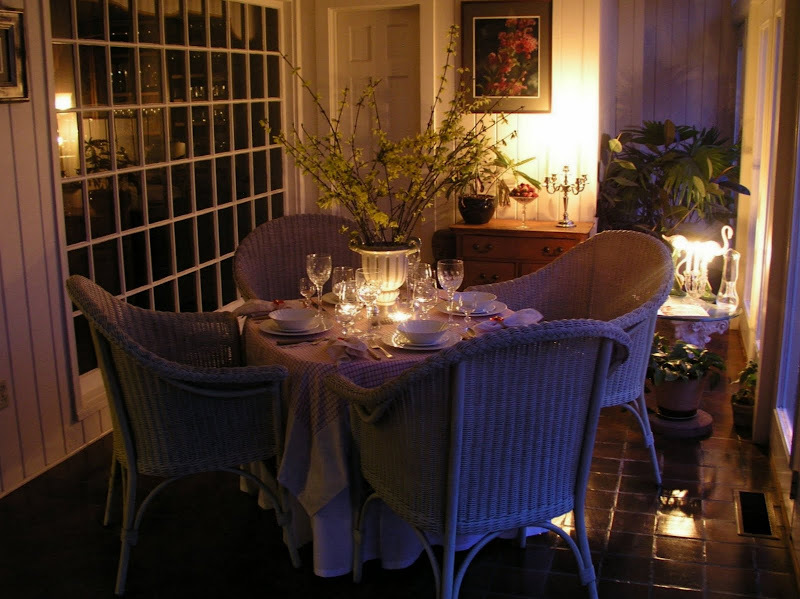 I'd be delighted to have breakfast, or tea, or dinner...in the solarium. April Cornell's linens are beautiful. 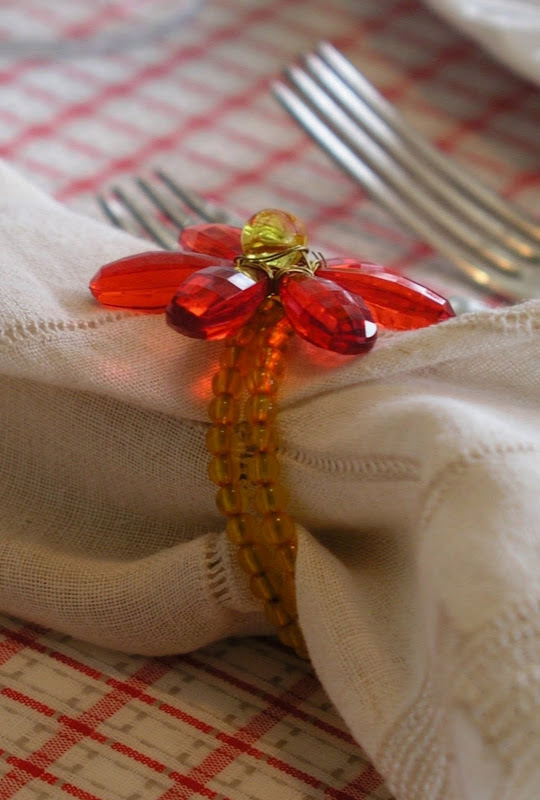 I was going to say that I really love the strawberry napkin rings, then I noticed red flower napkin rings...I had to go back in your post to see if I was "seeing things." LOL The strawberry glassware is adorable and looks great on this themed table. Love the compote too, and the crystal by candlelight, and the so aptly described "blue time" - great job. I would love the April Cornell napkins. I do like her blueberries pattern, but my favorite is Eden Yellow! I am one of your followers and thanks for doing the giveaway. Have a great week and if I haven't said it before, I will now...thank you for inspiring me to do prettier tablescapes...and to "thrift." Beautiful, Bill. Yes, your comport is Cambridge Rose Point etch. This is one of my favorite patterns and our personal stemware is this design. My favorite pattern is Meadow Embroidery. I liked several of them with the bright cheerful designs. I subscribe by email. Thank you for your generous offer and another beautiful table. Hello! I am now a follower, love the awesome table transformation you did-by candlelight is simply gorgeous! April has some lovely collections, full of vibrant fun colors. The fiesta plaid is full of happy tropical colors that make me smile. Another one I enjoy is the Mexican Patchwork-considering most of my decor is Southwest, Central American theme, the colors definitely fit into the scheme of things around here, and the design combines well with hubby's Guatemalan wall hangings. You've done it again, absolutely lovely! Me again Bill. I had a look through the April Cornell site. Wow they are bright and cheery. I think I like the Picnic Plaid one best. So pretty! Your put so much time and energy into your tablescapes. Love the strawberry theme - looking forward to local berries. Hi Bill! I just love your tables! 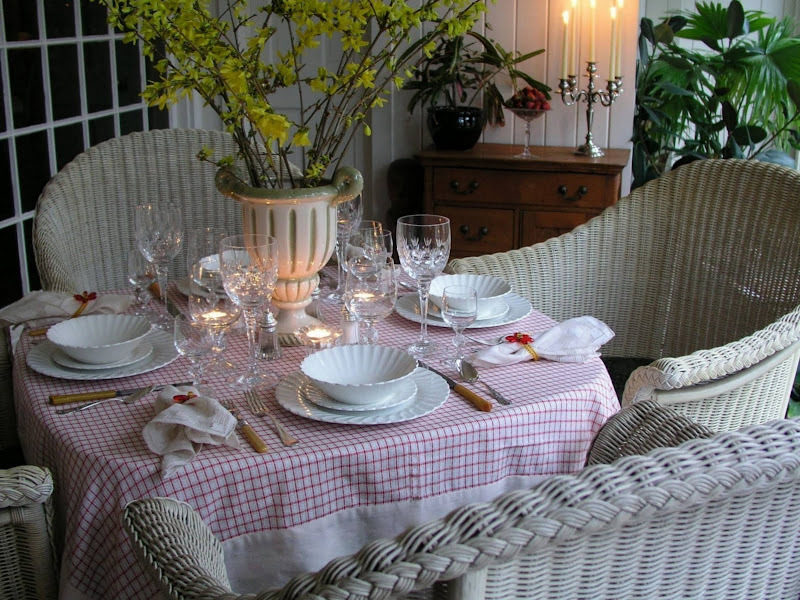 And April's Primavera Peridot would look beautiful on my deck table under the plum tree when it blooms, set with my Wedgwood Nantucket Basket white dishes, pink napkins and pale green glasses...or maybe my lenox Charlotte dishes...or...so many options!!! I hope I win! p.s. I'm also a happy follower. What a wonderful table! I love how the forsythia seems to glow when the candles are lit! And the berries look especially delicious in that elegant compote! I've recently "discovered" April Cornell and am in love with all her collections. It's hard to pick a favorite but ,of course, I'm really in love with the Genevieve Yellow collection at this very moment, because of the blue and yellow, which is a favorite color combo of mine. I am also a follower of your blog and look forward to seeing your beautiful tables always! The Strawberry Table is Beautiful ! I love the April Cornell Rose Garden .I am a follower ,please enter in your Fab dive away ! I am LOVING these spring-y tables! They make me oh-so-happy! So I went to April Cornell's site and my goodness her whole collection of spring linens is beautiful! I can't narrow it down to one, so my three favorites are "strawberries," "blueberries," and "garden plaid." I am a loyal follower of your site and would be super happy if I was the lucky winner of those adorable napkins. I can almost smell the strawberries, I feel like I am actually in your gorgeous home from this story and your images. There are so many of my favourite things in this tablesetting, the cutlery, the plaid tablecloth and the chairs and the great mix of glassware. You have again blended everything so beautifully Bill, I hope you did share this with some special friends. Oh,,and I just love this room, I would entertain in it all the time. Happy Tablescape Thursday dear one. Thank you so much for your kind comments. Sorry for delayed reply. This post is so lovely. I would just feel very pretty sitting at this strawberry table. your newest follower and happy to be so as I will now know when you post more beauty. Love the "Walk About" in your house! It's almost like when your walking through my neighborhood at night and you get a peek into someone's home! Love the strawberry theme! Very lovely! 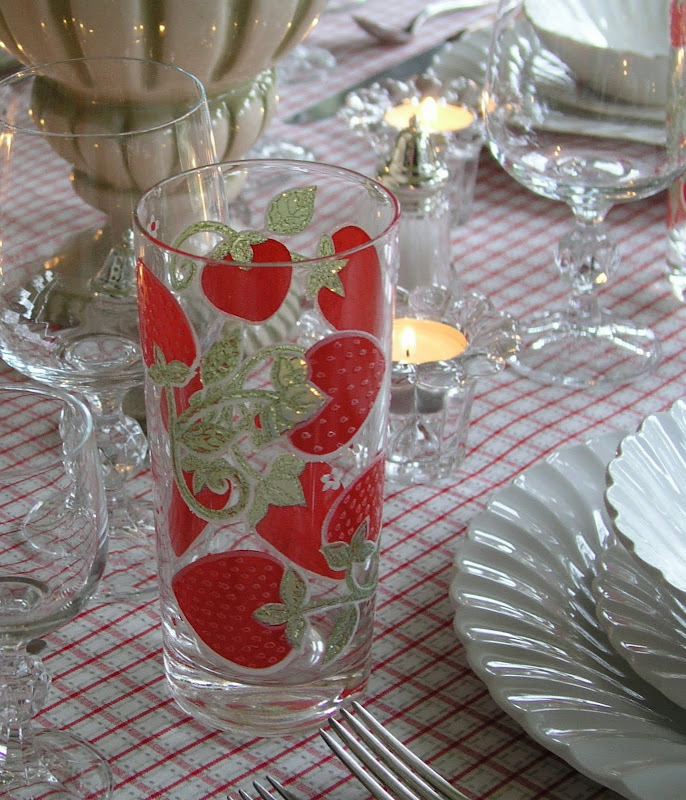 Those strawberry glasses are wonderful and perfect for your table. Love the pictures by candlelight -just gorgeous! Maybe I haven't been here lately, but I really appreciate the bigger font you are using - so much easier to read! we are now followers and we LOVE April Cornell! Really don't have a favorite, but maybe the Rose Garden? Your setting is beyond words-gorgeous! 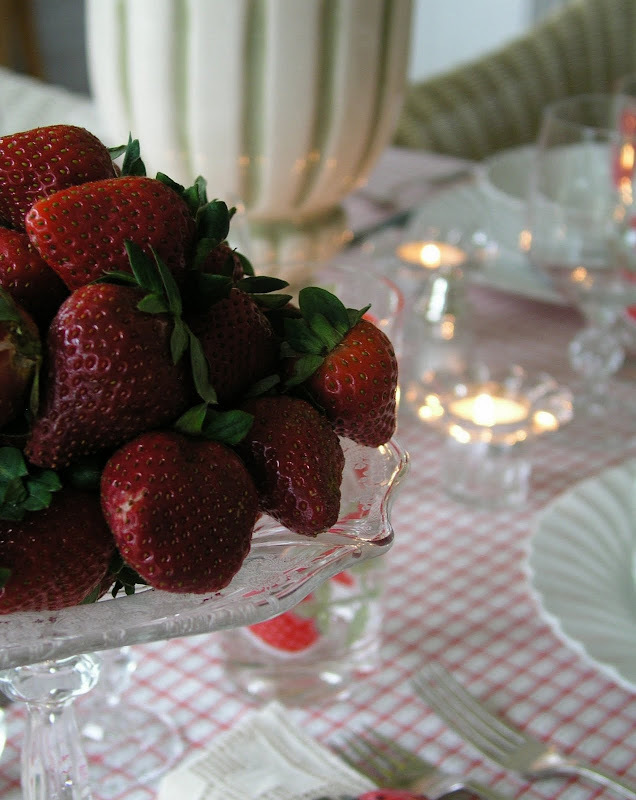 Your table is wonderful...reminds me summer is coming, but we have a long 3 months to go..Strawberries..wow! I can't wait.. I love the cloth you chose too, but there are so many that I would love. Do you ever have guest over for these wonderful tablesettings? HI Bill, Can I go to the estate sales and shops with you. You pick up the most marvelous things. And I have been checking at our GW, and I don't find much. Your white dishes are beautiful!One cannot have too many white dishes! Now, Oh, my my my! What an absolutely genius idea to make a changable skirt for your table. With a drawstring for ruffle thickness, no less! This is an idea I will certainly do!This has to rank in my top 5 tips I have seen since blogging!!!! I can think of so many things to do with it. Your table is fabulous, as usual. Too bad we don't live close, (maybe good for you, you would have to be one of my best buds! 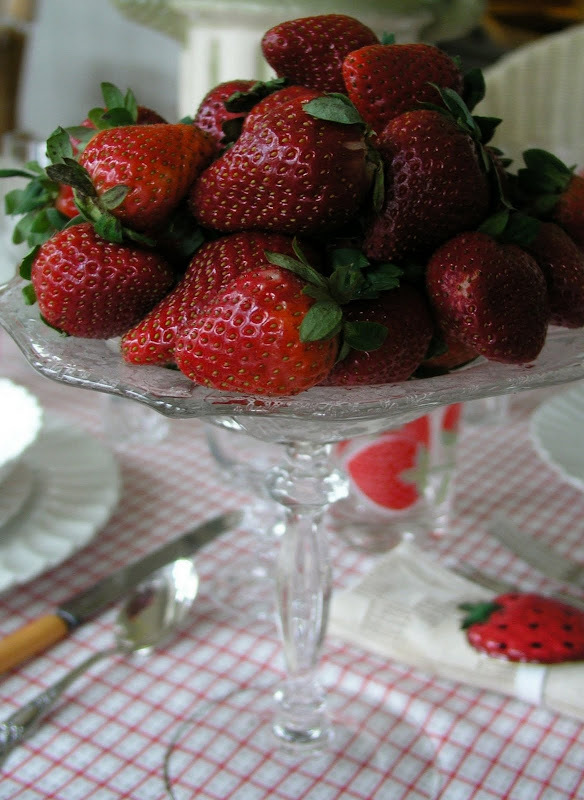 )I have the most lovely strawberry plates and serving pieces. I'm waiting for our Strawberry Festival here in Pa to do a table. 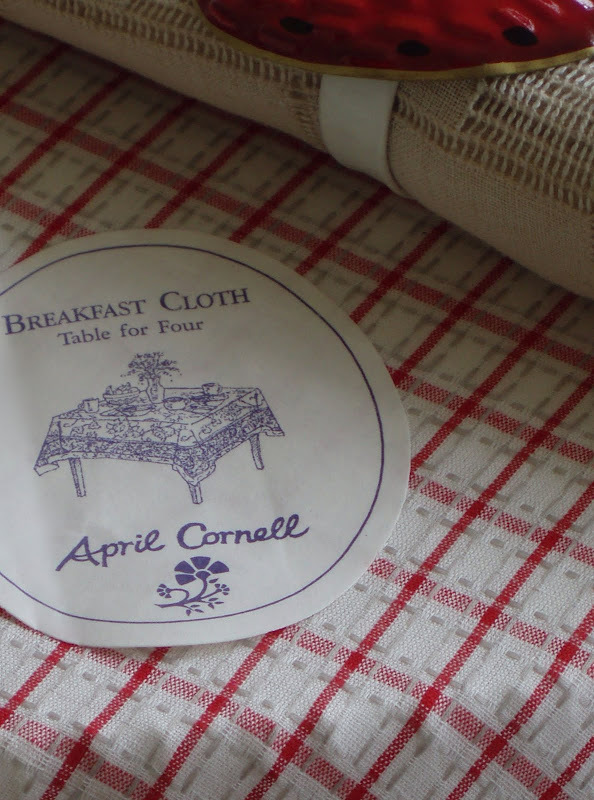 But that April Cornell tablecloth would look so nice on my table! The one that has caught my eye is Meadow Embroidery. I don't have many pink pieces or table linens and I love pink. Wouldn't it look lovely with pink depression glass? I think so. As I hope you know I am a follower. I just love your style. Thanks fo ALWAYS inspiring! 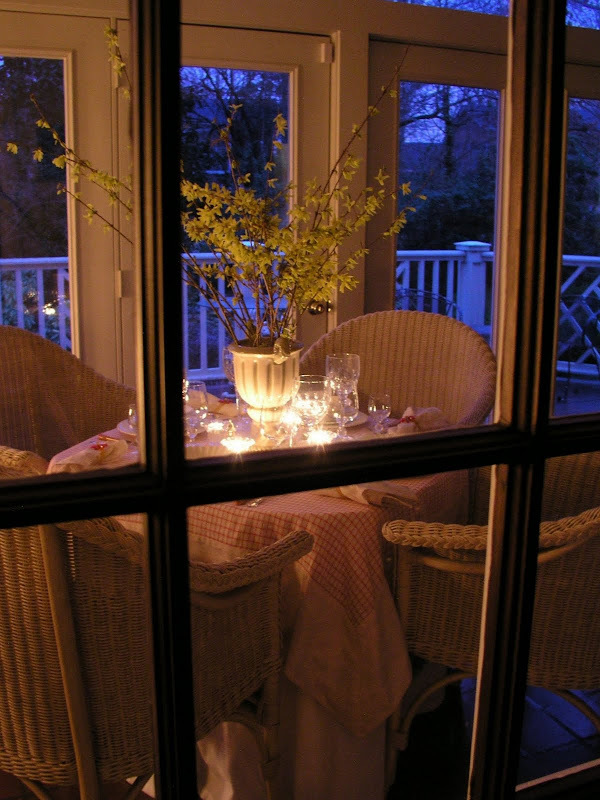 Your porch is lovely and the tablescape and your dialogue is awesome! Your photographs are very good. So many! Bet they took a long time to download! Very enjoyable. I am now a follower. I can really really taste and smell those berries Bill! And the tablescape is pretty spectacular also! Love the petticoat on your table, very clever! What a lovely place to dine. I would be out there three times a day! Just beautiful! Bill, you are kindness itself to mention me. 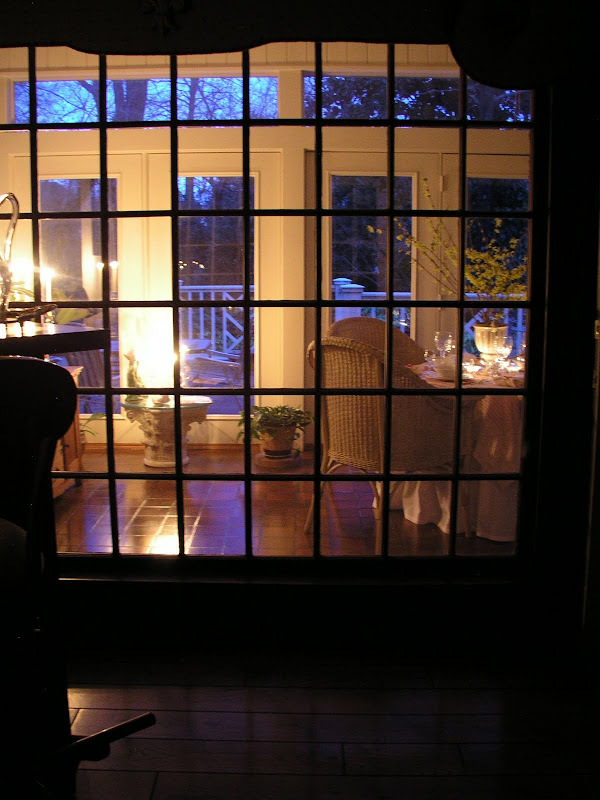 I was totally lost in the tablescape and your sunporch (and I tilted my laptop so Dr.Big could see how your room was glassed-in, which would be a saving grace for our winter-wrecked porch), when your words leaped out. 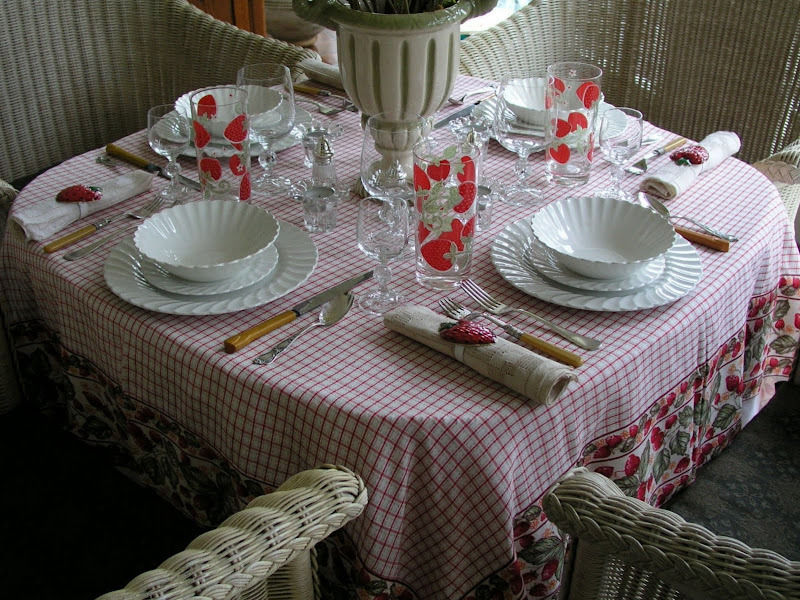 I love the way you layered the strawberry tablecloth with the white one (and what a great idea to use a sheet). 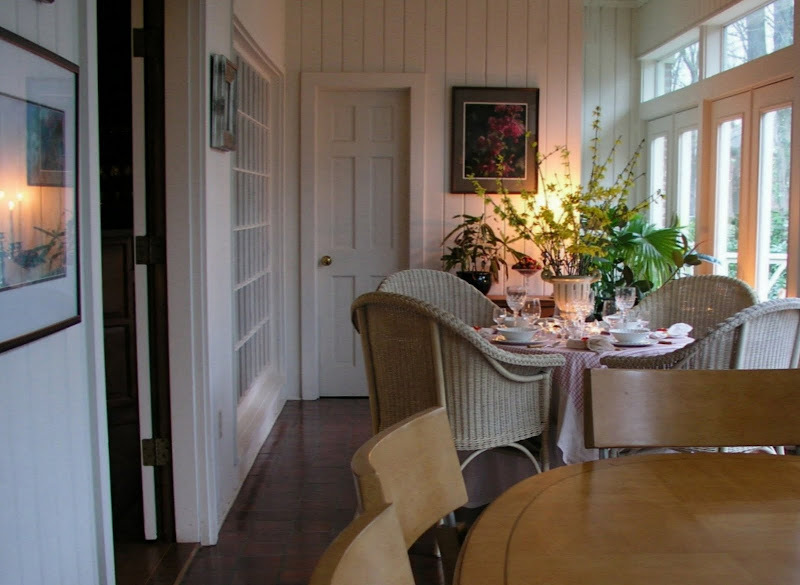 This is such a fetching room, a charming place to gather with friends, but it's so much more, too...purely gorgeous, as my grandmother would say. And I love your glimpse of the Chinese Chippendale railing on the terrace. Oh, I hope my forsythia doesn't get eaten by the goats! I can't name a favorite April Cornell. I love everything! But I specially love what you do with her linens! Damn, Bill, how did you garner so many followers so fast? Must be because you're a man, ya think? My favorite is the Madeline Yellow pattern. That raspberry ice cream in the picture has me drooling.... And yes, I'm a loyal follower so count me twice, please. HAPPY SPRING! Ummmm! I love strawberries! This is a beautiful table. I love your compote - everything is gorgeous (as always!) Now I really liked the pink and green plaid tablecloth (my colors) -- however if I were to be lucky enough to win those wonderful napkins -- I'm certain that I would hurridly purchase the tablecloth to match! Bill, what a yummilicious tablescape! Love the glasses and the forthysia and of course those luscious strawberries. Bill-Just like the reversible linens--two for the price of one! I must be the only person alive who has not heard of the April Cornell line--but thank you! These linens are fabulous--fabulous! Since I love blue and yellow I am fan of the Genevieve navy...oh and the pink and green garden plaid too. Really, I could happily own ALL of them. Now back to your tablescape--I proclaim you King of Ambience!--a small southern kingdom. Glad to know I can have you delivered by emai:) Signing up immediately! Wonderful giveaway!!!. My favorite AC was Eden Yellow. For some reason it just sings spring....Thanks for throwing me in the hat. I am also a loyal follower. Love to see you using COLOR! You know I love April Cornell's designs. Hi Bill, What a wonderful tablesetting you have prepared for us tonight! I am lovin' the sweet little Manatee preparing to read Veranda!! I am amazed at all the great patterns April Cornell has to offer this spring...my favorite is hands down, Honesty Yellow. :) I am already a follower of your blog. Thanks for sharing! Bill, your table is gorgeous. I would so love to have lunch on your porch. I am a follower, and I have just subscribed via email. I love, LOVE, April Cornell, and I could use every single spring pattern she offers. If I must choose one, it might have to be Josephine Light Blue, and I mighe even be able to mix a little Shannon Plaid with it. Thank you for such an inspirational blog. I love the way you surprise us with every aspect of the room and table decor and how "ambiance" is always present! I eagerly look for your weekly email announcing your link to BNOTP Tablescape Thursday. And...it's very cool when you are first to link! And I appreciate your quick email responses, too. Please continue sharing your tips, knowledge, talent and gracefilled photos. I would probably pick the rose one 1st, chelsea 2nd & the blue patchwork one 3rd, but they're all very nice. I was just in Home Goods today & they had some AC tablecloths. Love your table. you are so fortunate to have a solarium. We need to have the full home tour. My favorite of your photos is the one taken through the window from the 'bar'? area. Pretty sure I'm already following, but if not, I'll sign up. Bill. This is such a lovely post. I always look forward to yours each week. What a great idea for the underskirt. I learn so much from all of you that are so willing to share your great ideas.Thank you. I love April Cornell linens. My favorite of the day is Eden Yellow. I am a follower of yours and have subscribed to receive your emails. This is all so pretty! Your photography is more than wonderful!! I think my favorite April Cornell is Josephine, or is it Jamavar?? Hmmmm. I'm a follower. I used to be on the email thingy, but it stopped. Wow just stunning! I love it all. I appreciate you showing the undergarments (great idea) The photos with the candlelight are so romantic. You have inpired me. I love the beautiful napkins too. I look forward to following you and receiving your emails. P.S. 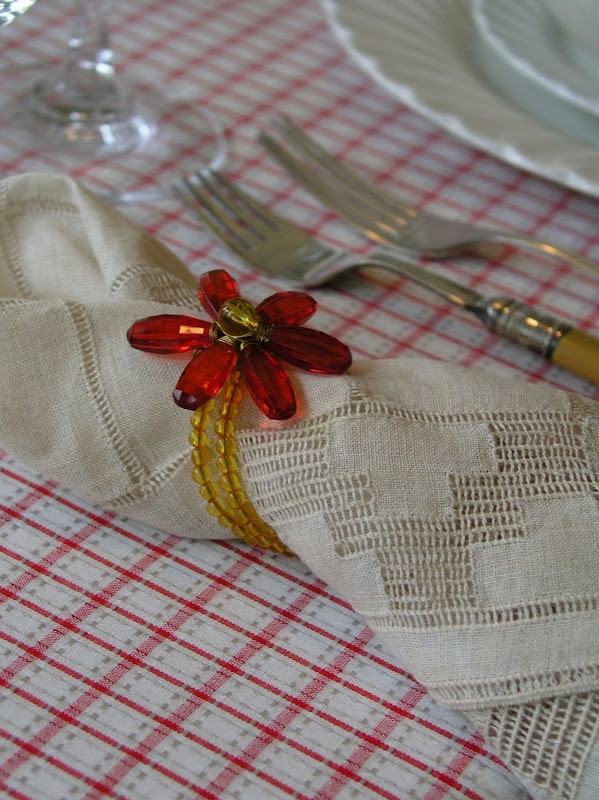 Stop by to enter my napkin ring giveaway! Oh and my favorite linen is Paisley Bouquet Orange. Fantastic colors!! Hi! Thanks for sharing this fabulous setting! I just joined in Tablescape Thursday for the first time this week! 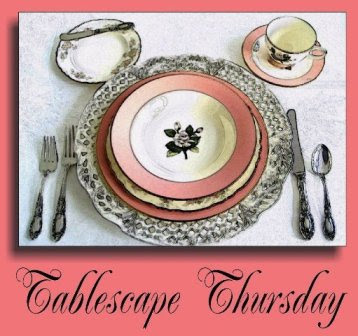 I'm excited to see all of the inspiring tablescapes! Oh, BTW, I am both a follower and a subscriber and it's entirely too hard to pick a favorite, but I really like Genevieve Chocolate! Bill, your post is incredible. I am a follower and did check out April Cornell and it was hard to choose but I think I will buy first the Fiesta Multi. I can imagine many uses for that beautiful tablecloth. I just posted about a strawberry cake on my blog and I was eating the last slice when I saw the strawberries on your post so I really enjoyed your lovely post. The "undergarments" you showed is a great idea. What an estate find! Strawberries are perfect in the Rose Point vintage compote. I could go on and on. Your "Day into Evening" post was a delight to read. Thank you for sharing. Bill, Your table is beautiful. I am a follower and your tablescapes always amaze me. I checked out the April Cornell site and I fell in love with shannon plaid, and honesty golden. What a lovely spring table! Love all the strawberry touches, and that reversible tablecloth is wonderful! Thanks again for your suggestions last week for my daughter's Rosalinde and for encouraging me to join the Tablescape Thursday party! Thank you, Bill, for giving me a little taste of FORSYTHIA! That is one thing I miss seeing every spring. Your strawberry table is luscious! Your setting would have been perfect here a couple of weeks ago...for the Plant City Strawberry Festival. I LOVE April Cornell linens! Thank you for introducing her (at least for me). Her fabrics are so beautifully colorful, it's difficult to choose which one I like best. Music Royal Blue would be the perfect foil for the coral colored dishes I bought a couple of weeks ago. Chelsea Yellow would be fabulous with my green plates. Hmmm...which to choose. The Blueberry napkins are lovely! I have just the right dishes for these, too. I am a follower...and I get your email updates. Thank you for sharing. I learn so much from you. Bill, Your photography is amazing! I have visted your site often and am now a follower as well. April Cornell Linens are new to me ,but I must say I am a big fan! I too love the strawberries but am also looking longingly at the music in royal blue! You certainly have a gift and I am thankful you are so willing to share! Bill, In order to create a table design this breathtaking one must be a true artist and that you are. I am in awe of your talent. 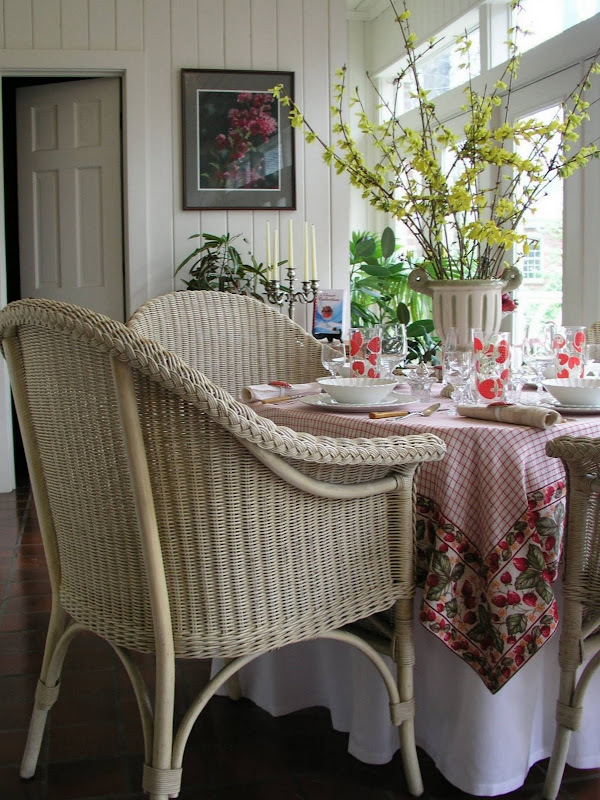 I am dreaming of being seated at that table having a lovely beverage and eating one of those luscious strawberries. I do not have the strawberry April Cornell linens and I would love them. I follow you and adore your blog! I love reading your blog. I just signed up to be a follower too. My favorite is the strawberry too. It is so spring and summer. We had an April Cornell in Memphis but it closed and I sure miss it. 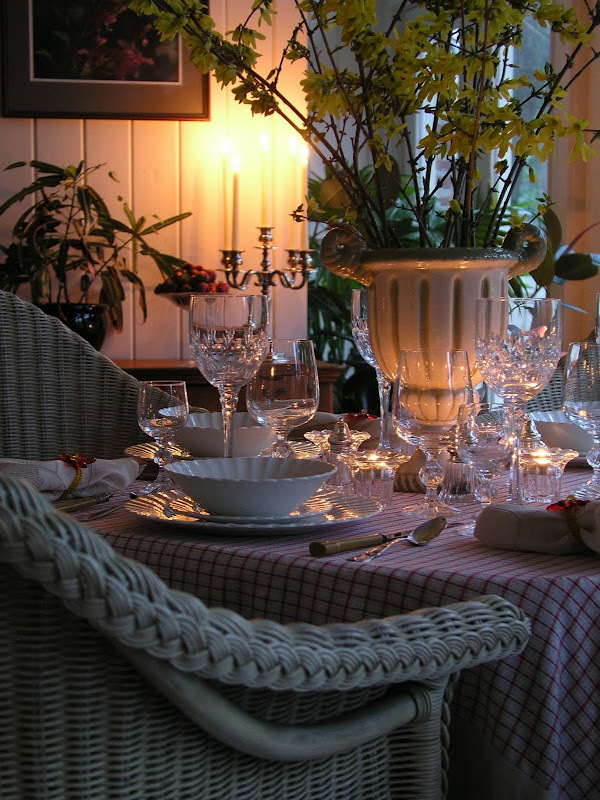 Thanks for your great tablescapes.Love all your pictures too. Your table is beautiful, as always. Very refreshing and serene. And, inspiring. This was my first visit to the April Cornell website. What fabulous things I found there! It was so hard to decide which was my favorite pattern. I think maybe the Rose Garden. Then again, I also loved Garden Jacquard Pink and Eden White. I am a follower of your site and I get your emails. 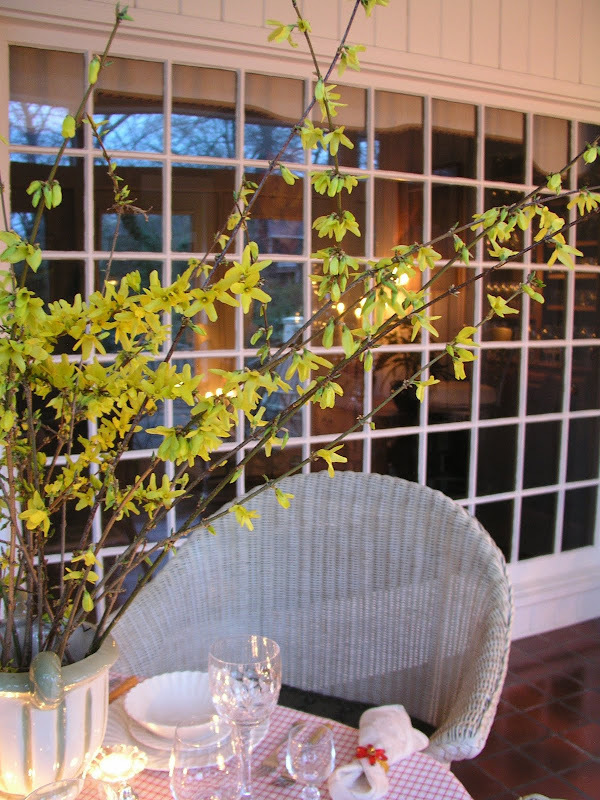 Now I can't wait for my forsythia to bloom so I can bring some indoors! My daffodils have finally bloomed, so at least that is something beautiful for the table. Bill you are just simply AMAZING! !~ I have to say without judging others.... you are the best table scaper in town! And that is my opinion and I am sticking too it! That strawberry bowl was beautiful...everything, the flower arrangment, the candlelight in the evening, ahhhh, what more can I say..your the best! OH. MY. GOODNESS. I just found your blog. What a yummy tablescape times two!! Thanks for the tip about April Cornell. I'll definitely be purchasing some table linens. My fave is the blueberries followed closely by strawberries. I am now a follower & also an email subscriber. This lovely tablecloth is just to die for. Two looks for the price of one is very hard to beat. You've made both tablesettings look fabulous. You are REALLY getting good with that camera, too,Mister Bill. I do love all your photos so much. Well I just love that tablecloth...so much in fact last weekend I was in Fredericksburg Texas and bought it!! Mine is not reversible like yours though...and I love that about yours! Your tablescapes are just beautiful! I love how you have your dishes layered. April Cornell collections are just the best...I have several but my new favorite is of course the strawberries. I have to find some other pieces to complete my table. 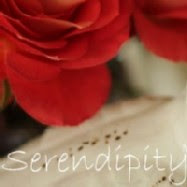 I am a follower so please enter me in the giveaway...you can never have enough pretty linens! Hi Bill, this post is the berries! I love it when you set an intimate table in the downstairs area. I've a long time serious love affair with wicker, so this setting definitely appeals to me. And you do it all so beautifully. I did click on over to April's site and though I find each of the offerings appealing, I'd pick the strawberries myself. I like the simple weave top with the border. And the fact that it is reversible makes it all the more appealing. Those strawberries look seriously scrumptiously delicious, and the compote is the perfect perch for these delights. The forsythia is one of my favorite spring time blooms. We don't have dogwood or apple blooms here, so forsythia is a nice substitute. 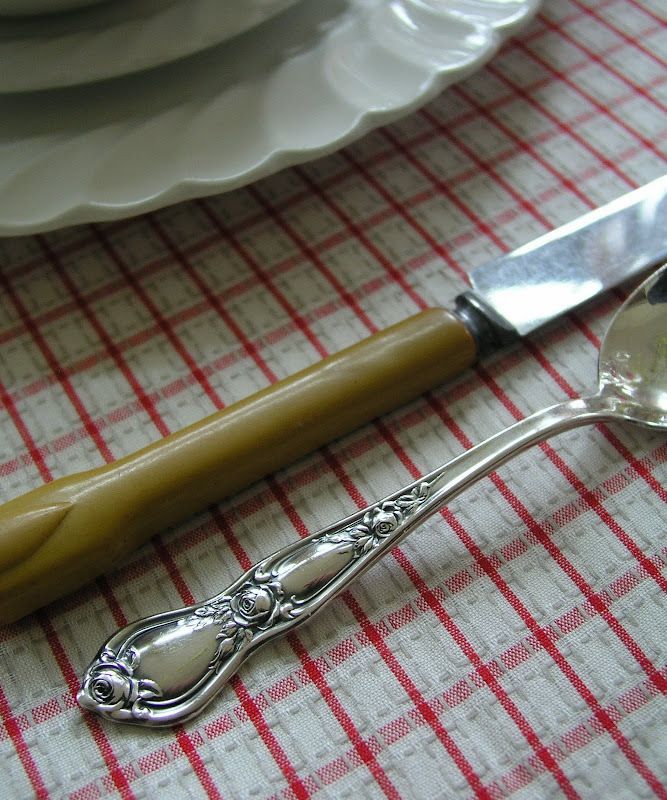 Love the mix of flatware with the vintage bakelite and silver my favorite. There is something about the mix of textures on these pieces that always calls to me. Your tablescape is lovely, Bill. I especially like the strawberry glasses with the new table covering. Your setting looks gorgeous by candlelight. I like the sparkle on the glassware. Well, this has got to be the freshest and most casual tablescape I've seen you do. I love it! Count me in for your contest. You know I've been a follower since day 1! ;) I think the Genevieve Chocolate is yummy! Ooh! I love the Russian Chintz collections! It would be beautiful with mu creamy dishes! I do love your Strawberry tablescape! It makes me long for May when the berries get ripe where I live! Bill, I am now a follower of Affordable Accoutrements! Please enter me again in the giveaway! I love all of your tablescapes but the cosy ones, that you create in this area of your home, I always find particularly charming. The reversible strawberry patterned cloth is lovely but either Blueberries or Chelsea Yellow would be the ones for me.If only they shipped overseas! Perhaps my friend Sarah "Hyacinths for the Soul" could help me out as she'll be vsiting me here in Normandy next month. I've been a follower for quite some time now and would love to be included in your great giveaway, merci beaucoup, Monsieur Bill. You take my breath away with your table. Of course I don't know where to begin. I love the forsythia centerpiece and April Cornell is my favorite too. I have many tablecloths and napkin sets. Loved the mis-matched silver, especially the bakelite handled ones. You are so talented putting it all together, and your photography brings it all to life. I almost feel like I'm there--and wish I was! I would ask you for a little tour of your gorgeous home! Bamboo canopy? Oh my! I seriously want to see that! BTW, I'm a follower, but also a "fan!" Bill, this has to be my favorite tablescape you've created because it is more "me." As in, casual and a little rustic. I adore the tablecloth. I will have to take a look at those. The strawberry glasses captured my heart. 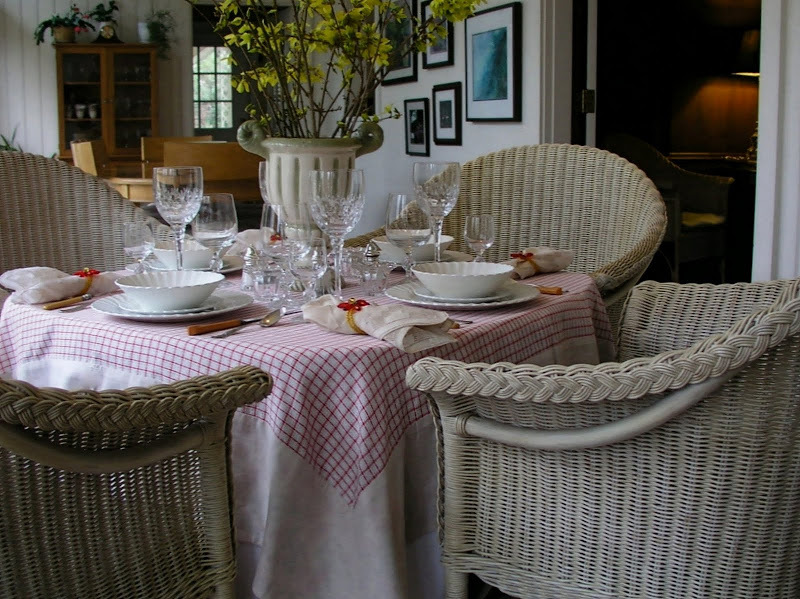 Your tablescapes always exude warmth and elegance. Bill, thank you for stopping by! You always leave the nicest comments. And wow, are your pics a feast for the eyes. The strawberries just jump off the screen over here. What a beautiful table setting right by the windows. I don't even know where to begin, it's all so gorgeous. I'd have to pick the CA check over on April's site for my fave. Love all that green! Thanks again for stopping by! I love her Genevieve Yellow collection. I like the variety of colors in this particular collection. Your table setting, as usual, is absolutely stunning. Just wanted to let you know that Iove your tablescape. Gorgeous photos! Makes me crave strawberries. Thanks for taking the time to create such beauty for all to share in. Well, you did it again...set another beautiful tablscape. You do wonders with the camera might I add. I have some crystal that I think is Rose Point...at least that is what my MeMaw called it. Too many choices from April Cornell, but I liked Meadow Embroidery Rose and Rosehip Jute. Guess I like roses...huh? Thanks for the giveaway! Thanks Bill, for your lovely comment, I really needed that today! More than you could know! I got to look again at your wonderful settings and April's cloths. Oh the napkin ring is so pretty! You said Grandmother! lol I never thought of being one! lol They call me Granna, I guess I am a Grandmother! lol I wish I were the best one! Oh, for as all my surgeries I only got to hold them when they were born, just now I get to give them a hug. A real Grandmother would hold and cuddle them! I am sometimes so jealous of the wonderful Grandmothers out there. lol Thanks Bill! ll be sure to mention I found it here if I can accomplish this task.. Thanks so much for sharing how it should be done. Oh you gave us so much eye candy this week! Love it all, but then I love red, love the room , wonderful you can have so many there if you want. This was to fun! Oh and I am a follower and also I like the Genevieve Chocolate collection, lovely website, thanks for the give away, hope I win!! Thanks so much for visting and for the lovely compliment! I am just as entranced and thoroughly enjoying your fabulous tablescapes as when I first laid eyes on your masterful tablescape vignette, creations! This week the whimsicality and freshness of April Cornell's, 'Strawberry motif tablelines collection', with all of your rich layering of pretty, fresh and classically elegant details is just so utterly refreshing;also, 'the day into evening photography', always makes your tablescape vignette fairly sparkle!..,It transports me as a viewer into the experience, as if there, beholding and enjoying that ephemeral passage of magical and oh-so beautiful last vestages of daylight; those 'blue moments of day into dusk', as mentioned so eloquently; just as we enter into evening.., I have always so enjoyed that time of day! My, I love this vignette Bill, as it so poignantly captures that specific time of day with photographic, visual eloquence with your singular artistry!..,I especially also adore the strawberries and that lovely glass, footed fruit compote!~ A still life masterpiece in and of itself! Lastly, as an aside, I well recall being across the hall and a wee bit down the isle from April Cornell's showroom in 'pavillion on ten', at the Giftmart in Atlanta, several years ago now.~ Also her, 'La Cache' stores were some of our first customers with my 'Wanda Lee wholesale artline' in Canada.., I well remember her trade show presence over the years in Toronto and many North American cities as well! What an exceptional and talented lady she is; I adore her line!~ Good for her! I just found you via Marty's party (trying to find some vignette ideas for my buffet! )- I love the rose garden cloth and would love to be entered in the fun giveaway!! I also am going back and becoming a follower right now! Gorgeous pictures and beautiful table! Well, here I am, I'm late, I'm late, I'm late for an important date! I am so sorry AP went away here in Bham. Since I have a ton of strawberry dishes, I am going on the website pronto and find that strawberry cloth! I bought some strawberry pink napkins the other day at TJMaxx, and they will be on my Easter table when I get around to doing it. L'heure bleu is my favorite time of day, and you have captured it so beautifully with your camera. I think there is even a perfume of that name,if I remember correctly. I am a new follower. I LOVE this post...love the rain shot and the "blue evening" shot. My fav is Genevieve Yellow. I swear I think I saw it at Big Lots here in Bloomington, IN. Invite me to dinner! IN is not that far from TN. :-) Oh what shall I wear? it took me a while to articulate my comment to your post. I looked to a lot of your tablescape-posts and I liked them all. So I wanted to check out what is the special on your tablescapes? And now I know! It is not only the admirable house and this huge stock of fine china, glasses and your collection (yes it is also fetisch, yes!) of flatware. Your skills by taking the photos teaches your readers to see the magic of the moment, when the darkness comes and glasses begin to reflect the candlelight. Your tablescape is not just tablescaping. You stage the table and china, glasses and cutlery are your actors. You tell them how to pose and to sparkle. Your posts are complete stories with initiation, climax and finale. You are an artist, there is no doubt. Requires a high level for all of the participants of tablescape-Thursday. I like that all very much. 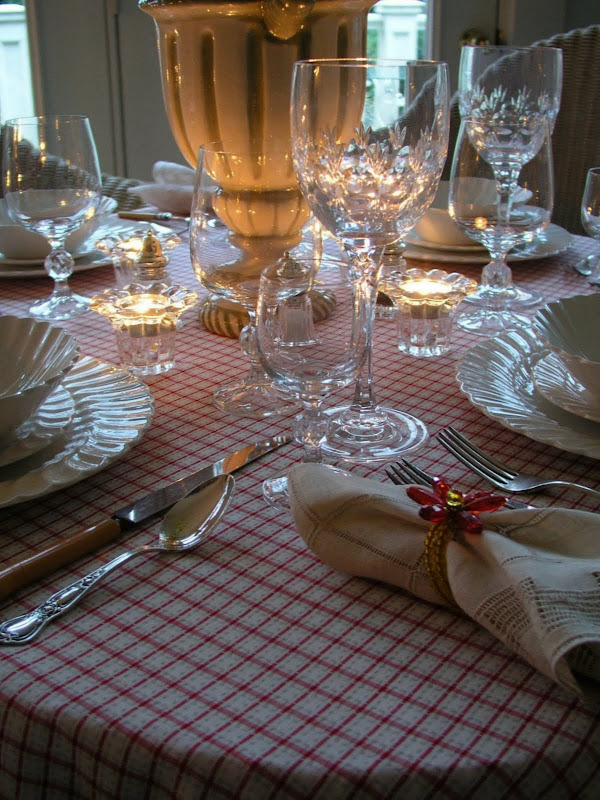 We share the love of fine flatware and nice decoration. I have just the problem of very little rooms, so I cant collect all I want. I like also that you explain the manufacturers. I am always curious about that, but I would not turn around your Lighter to look at the brand! Thank you for sharing that all. I surely will come back every Thursday! Lately it seems I am into yellows, loved the Madeline Yellow set. Have enough to set a pretty table with the addition of those blue napkins. I hope I win. I also follow your lovely blog. Hi Bill. I love strawberries and forsythias! Just had some on my front porch. I'm really ready for strawberry season! Hello, Bill! Your tablescapes are always the best! The very best! I am a follower and I also receive your emails. They always make my day!. I love April Cornell...just soooo me! LOL My favorite would be the "Genevieve Yellow" line because they would go so well with my blue and white Coaching Scenes china. I will be keeping my fingers crossed in your napkin giveaway! Very pretty tablescape. Love the compote, so pretty. As for April Cornell, I love the Meadow Embroidery tablecloth. Yes, I follow your blog-you are in my "feeds". Great tablescape this week. Would love a house tour, lol! My favorite is the Paisley Orange BOuqet. I was immediately drawn to Flower Market Orange. I check your blog periodically, but have now subscribed. Your ideas are magnificent! 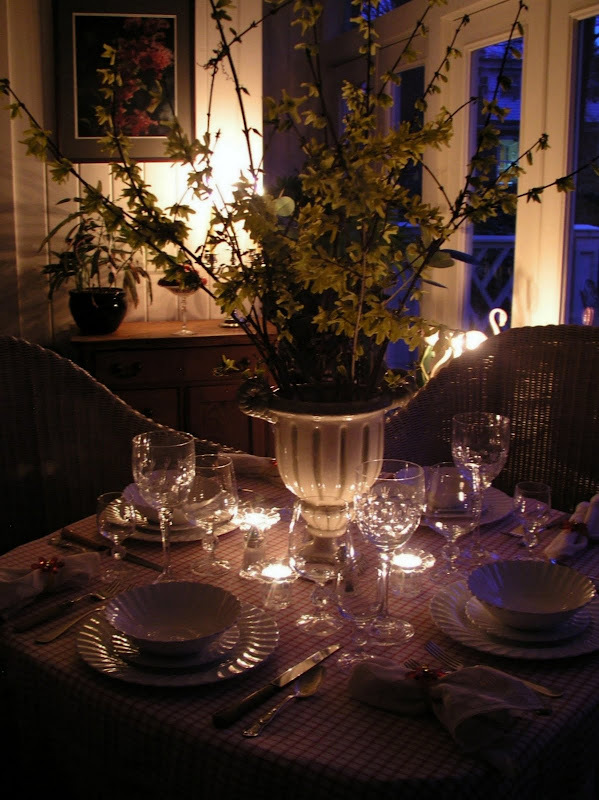 I am an avid follower of your blog -I feel I am in a magical land when I see your tablescapes and creativity. My favorie is the strawberries-long memories of picking strawberries every year with my children. ...and of course I am a follower! Hi Bill! I forgot to mention that I love April's Strawberries and Blueberries! Greetings, Bill -- hope I am not too late to join the 'give-away' but, if I am, no problem because I am happy to have discovered the April Cornell website through you. Beautiful items! 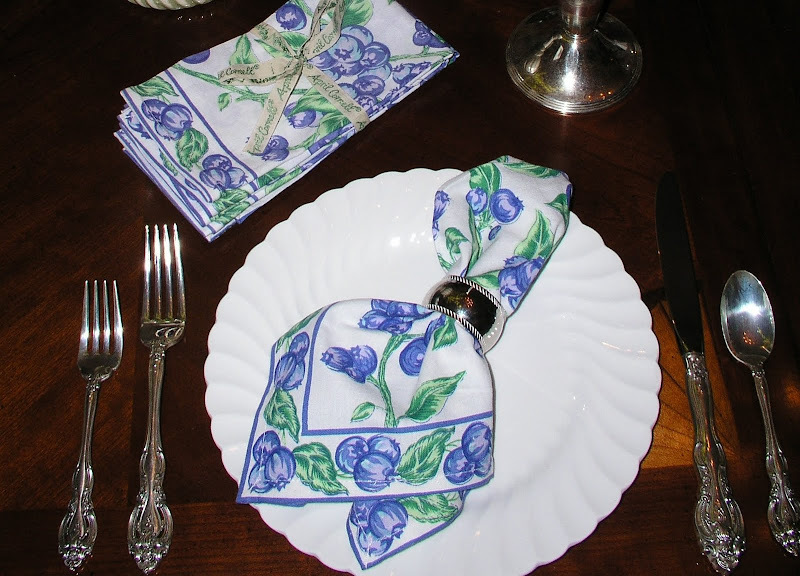 For the drawing survey, I really don't know WHICH is my favorite, but if I won the blueberries napkins, I would buy one of her blueberry tea towels to go with them-- so pretty! And yes, I am a follower of yours and yes, I subscribe to your emails. And, before I close, may I say that this post and your current post, are both lovely. You truly have a gift. One request: can you do a "scape" of your bar area one day? I would love to see something you put together on your bar in the corner, I love it! Bill, I loved your table-----made me want to sit down right there and have a lovely supper! I loved the April Cornell collections too! It was very hard to pick a favorite, but I think the Meadow Embroidery was one of my favorites. I am a follower of Affordable Accoutrements as of today! I just stumbled onto your blog and loved it! You are very talented! Pink + Yellow = Spring!! !